The premise of Anno Dracula might seem a little out there, but it's straightforward enough. 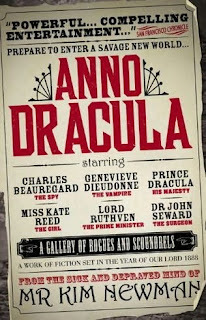 It’s a Victorian London where every fictional vampire ever written is real (along with a bunch of other fictional folk), and Dracula is married to the Queen. Jack the Ripper is on the prowl, targeting only vampire whores and tensions between vampires and “warms” (humans) are rising. Whenever I go to describe this book I found myself saying things like ‘a cracker read,’ and ‘a rollicking good time, by Jove.’ All said with a rubbish British accent, natch. The book is just so overwhelmingly and charmingly British, circa the 1800s. Everything is all correct manners and cricket and chivalry. But at the same time Newman pulls off the impressive trick of sounding authentic and modern at the same time. The book did not read like a novel in 1880, is read like a novel set in 1880. A small but important distinction, if you ask me. And you might think that all the Britishness would get old after a while, but I never found this to be so. The plot and characters are strong enough to carry it, and it makes for a highly unique and enjoyable read. 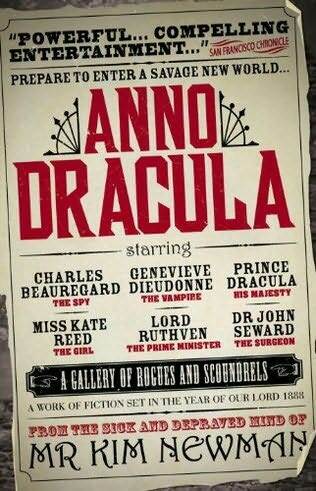 In some ways the book reminded me of Gail Carriger’s ‘Soulless,’ although ‘Anno Dracula’ has almost 20 years on it. But it’s a similar setting, and one where vampires have only just come out of the closet, as it were. Newman, however, delves far deeper into the ramifications and politics of this than does Carriger, and it was one of my favourite aspects of the book. I also enjoyed that, while many steampunk authors tend to glamorize the era, Newman does not shy away from the uglier side of the time. When asked what would they eat when everyone in Britain was a vampire one character points out, in a most reasonable manner, that they would simply import Africans to serve as cattle. A repulsive idea to you and me of course, but the matter of fact way its said in the book shines a light on the way people thought back then. This book is also a literary nerd’s dream. The world Newman has created feels fresh and original, but really is the results of taking a whole bunch of other books and smooshing them together. There are scores of familiar faces, from Dracula to Jack the Ripper to Dr. Jekyll. But more fun than the named characters are the ones only mentioned in passing. I was ridiculously proud of myself when I spotted Anne Rice’s Lestat from only a sentence of description. ‘Oh ho,’ I thought to myself, ‘I bet not too many others were canny enough to notice that!’ Then I looked on the internet and realized for that one little reference that I’d gotten there were, oh, a bazzallion others that I’d missed. And it didn’t effect my enjoyment of the book at all. So if your knowledge of classic works of horror is limited, don’t let it put you off this book. My only issue was that sometimes I would be unsure if a character was Newman’s original creation or if he’d borrowed them from somewhere. It would pull me out of the story a little and I’d have to go look it up to be sure. The book technically isn’t steampunk, but the rise of the genre is almost undoubtedly why the book got reissued. I’m sure steampunk fans would get a real kick out of, as will vampire fans or horror fans or queen Victoria fans or, well, pretty much anyone who likes there fiction a little on the quirky side.